As if peopleofwalmart.com wasn’t a complete and utterly repulsive testiment to the ridiculessness that this satan spawn storefront, I present to you super fiends another reason to hate their prices that got us so low and ways to take matters into your own hands. Walmart recently paid $24 million in bribes to Mexican officials so they could dominate the market – and then top executives in the U.S. tried to cover it up. It’s yet another example of greedy CEOs thinking they can corrupt government and get away with it – but this time, we can prove them wrong. Under U.S. law, the prosecutors have a choice: they can let the company off the hook with a fine, or they can send a message to the corporate world and put Walmart’s bosses in prison. Walmart is lawyering up and betting they can negotiate out of this fix, but we have an ace up our own sleeves: the prosecutors work for us. Let’s let them know we want the bosses held to account, personally. Pick any item $10-$50 from the shelf. Walk to the entrance and get a return sticker for said item. Proceed to customer service and return item for store credit. Buy party essentials (Some, not yet all, Wal-Marts carry alcohol). Technically, I guess, some might consider this stealing. To them, I ask, how can you steal from that which has no face? No needs? No soul? 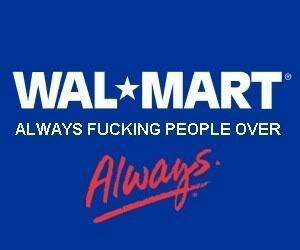 Walmart is already one of the worst corporate actors there is, lowering labor standards, putting local stores out of business, and sucking money out of every community it invades. Now we know it’s corrupting governments as well and tilting the playing field to win by cheating. Walmart has already expanded to 26 countries and they no doubt have their sights set on more. Unless we take action now, they’ll continue to burn their destructive path through more neighborhoods around the world. But we have a chance to turn the tide. The Foreign Corrupt Practices Act makes it illegal to bribe foreign officials and the Federal securities laws and Sarbanes-Oxley make it illegal to cover it up. If we turn up the heat on federal prosecutors to hold these gold-counting executives personally liable, we can hold Walmart responsible for their actions and send a warning to corporate America: you break the rules, you pay the price. The criminal trail leads all the way to the feet of CEO Mike Duke and former CEO Lee Scott. So let’s make sure they’re held accountable and give small businesses a fighting chance.